Santa Rosa, CA (August 6, 2017)-Lightly raced Summersimage ($8.60) scored a hard-earned victory as he made his turf and two-turn debut in the $66,625 Robert Dupret Derby at the Sonoma County Fair in Santa Rosa on Sunday. The Slew’s Tiznow colt was bumped badly leaving the starting gate, but was able to bounce away from the trouble to take the lead and was never headed in the 1 1/16-mile turf race. 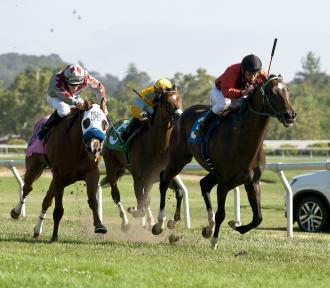 Summersimage, a William Hedrick homebred, broke his maiden as a 2-year-old at Santa Rosa but came out of the race body sore and went back to Hedrick’s farm. He did not return to the races until July 4, after being on the sidelines more than 11 months. He responded with an impressive six-length victory that earned him a 90 Beyer rating. Jockey Catalino Martinez got the colt to relax and set easy fractions of 24.35 50.08, 1:15.15 as he cruised around the course one length in front of Lucky Bode and favored Grecian Fire, who was third while sitting three wide. “The rider, Catalino, rode him perfect,” said Perez. Summersimage quickened as he turned for home, but Grecian Fire was also getting in gear and seemed to have his rival measured as the pair approached the sixteenth pole. At the wire, Summersimage had inched away from Grecian Fire for a half-length victory in 1:47.07. Lucky Bode was third, another two lengths back. “All you can do is give them time,” said Perez, who has trained for Hedrick for 33 years. “I was not surprised when he came back like he did because he was training good, and this horse has a lot of ability. “I’ve been galloping him two miles every other day, and I was thinking about running in the first allowance condition at a mile against older, but I decided to run here against 3-year-olds and a bigger purse. Summersimage earned $41,750 for his third straight win while more than doubling his career earnings which now total $80,035.